Compact, comfortable, and conversational, the Expressionist Confidant is perfect for artists who desire a smaller “go to” palette in their studio. It provides ample surface area for laying out your paints and mixing them in the upper or lower quadrant, as well as an open hand grasp to hold paintbrushes or a mahl stick. The Expressionist Confidant is ideal for finishing or detail work because its design allows artists to work extremely close to the canvas. 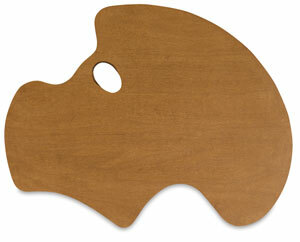 Available in a left-handed or right-handed version, it measures 20-1/2" × 16" × 1/5" and weighs 15 oz.